As many of you have probably already heard, the Occupy Wall Street camp in Zuccotti Park has been evicted. A raid conducted this morning resulted in 200 arrests of park occupants. 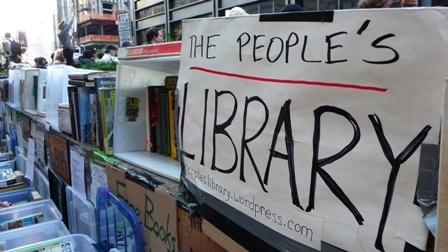 What most of you probably don’t know is that the Occupy Wall Street protestors had amassed a collection of more than 5,500 books in their volunteer-run Occupy Wall Street library. The volunteers have even set up their own blog for the library along with a catalog of the current collection. The collection of books ranges from Spider-Man Comics to Jane Eyre. The collection functioned using names in order to check out books. The ground practices listed instructions on everything from how to process incoming books to opening and closing the library. Unfortunately, when the raid occurred on the Occupy Wall Street protestors, the library was removed along with other personal property. Flyers were handed out at the raid with instructions to retrieve any abandoned property at the Department of Sanitation; however, it is unclear where the books ended up. ← Say it ain’t so, Joe!